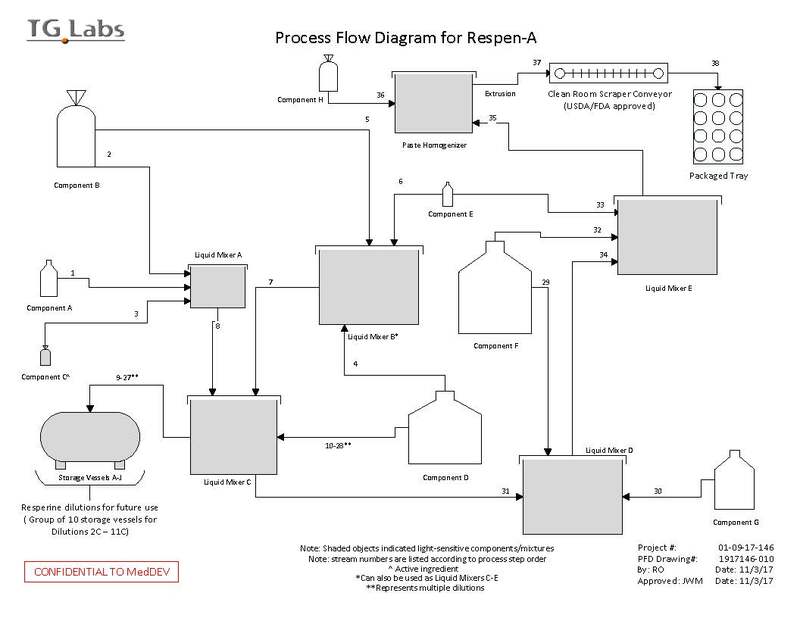 Base documentation required to build the process and run packaging and chemical quality control. All equipment needed has been broken out above. Each line item includes engineering and overhead cost for the purchase and assembly of equipment. Any required special equipment (i.e. not the cleanroom, tables and glues or solvents) must have an IQ OQ PQ qualification conducted. Chemical testing, in conjunction with equipment, will be necessary to show proof of concept prior to FDA submittal. This item does not include the cost of the chemicals required to facilitate the test. Those costs are broken out as 4.1.9 Startup Product, in the equipment section (1.C.1). All APIs are required to be tested and documented prior to FDA submittal. The stability testing will verify the stability of the active ingredients in the packaging. 3 tests will be run simultaneously to ensure the validity of the test. Once the appropriate sterilization process and barrier are selected you are required to ensure the sterile barrier is integrous. Manufacturer can represent a 6 month shelf-life on your labels as allowed by the FDA once device is manufactured. The FDA requires that you conduct a shelf life (aging or date code validation). A shelf life study shall be conducted for all devices. Manufacturer will conduct the test on the selected packaged product in real time and accelerated test methods. Base documentation required for NDA/FDA development and submittal. The NDA Development will consist of the engineering behind taking the drug through the NDA in route to the FDA. This cost estimate includes all the fees and provisions necessary for one submittal. These do not include cost of re-submission if it is not approved.